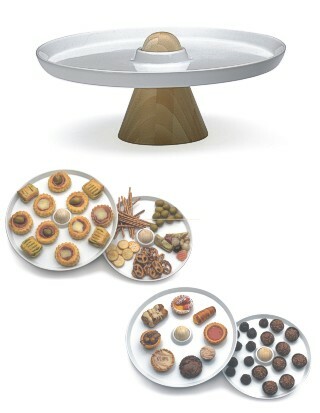 The Sombrero buffet dish demonstrates the virtues of Italian clear thinking and design. The conical base is made from solid natural side compressed bamboo with a natural waterbase finish and the white porcelain plate is easily removed with its contents - simple, no fuss and it looks great too ! This designer party piece is 10 cm high by 24 cm in diameter (4 by 9½ inches approx) and can be used for any number of great foods and of course candles, or maybe flower petals.